Amelia Bonetti: The artist is like a wolf - he hears the call of the wild. This wasn't a bad film, though those without previous knowledge of Fellini's films may not like it as much. Giuletta Masina and Marcello Mastroani give their usual great performances. I actually thought Marcello gave one of his better performances here, in that he displayed a great comedic timing. 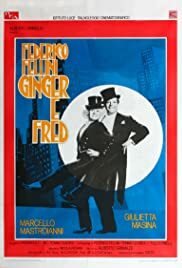 I am mostly familiar with Fellini's pre-1970 films so I was not sure how a film made in the 1980's would do (given how much cinema had changed from the 50's/60's to the 80's), but he still delivers an enjoyable film, thanks in large part to good acting by the two leads. I enjoyed the satirical attack on television and the modern era (advertisting, etc. ), which I happen to strongly agree with. The TV show scene near the end contains your typical Fellini "magic" and aesthetics, so I enjoyed that as well. This is by no means comparable to Fellini's masterpieces, but is still a well-made and enjoyable film, and more accessible than some of his more outrageous stuff he's made in past years. 7/10.